Hello! Thanks for clicking on that little contact tab above! Interested in promoting your product on my blog? I would be more than happy to review products from companies or anyone wishing to promote their products and services here on the Simply Samantha blog. I also love to host giveaways for products so that my readers can experience the product for themselves and share the product and company to their friends and fellow blog readers. In many cases I would like a free, non-returnable sample be provided in order to provide an honest and complete review. My blog is a family friendly atmosphere and I only blog and or review products that are appropriate for my readers. I want to assure any future collaborators that I am confidant in my social media skills in promoting your products. completed a Social Media Management course covering all aspects of social media. I can provide other information, such as analytics and data, if needed. If you would like to see some of the Reviews I've done please click the Reviews tab above. 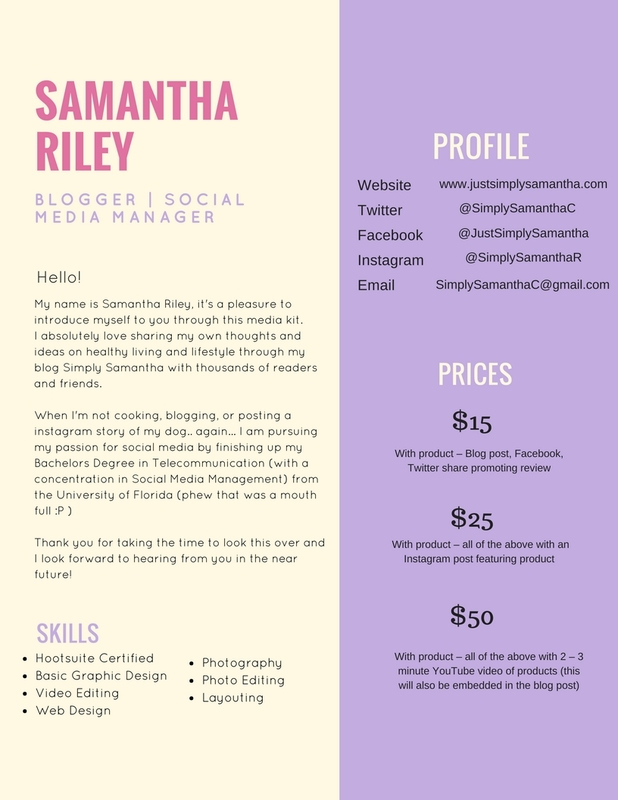 Also below is my media kit with prices. I'm very flexible so please feel free to email me with any questions! Thanks you so much and I look forward to working with you.